When possible, to conserve energy I hang my laundry outside. Our homeowner's association frowns on this action, but it's truly impossible to see into our backyard. We have a fence and an extensive amount of trees. So when it's nice, I bring out my drying rack and take pleasure in knowing I am saving energy, money, and the environment. So when I can make a yummy dessert and can avoid using my oven in the hot weather, saving energy and money. Sign me up! Line an 8x8" squared baking dish with unbleached parchment paper; set aside. Place peanut butter, BeeFree honey, and coconut oil in a small pot over a medium flame. Stir frequently until completely melted; remove from heat. 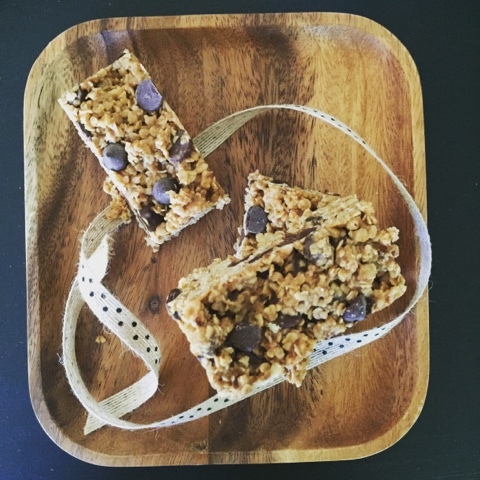 In a large bowl, mix together the oats, walnuts, and chocolate chips. Add peanut butter mixture and thoroughly combine. Pour mixture into prepared pan. Refrigerate for 4 hours. Store in refrigerator in a tightly sealed container. Oh my gosh! Is it fall yet?! I am so over this hot humid weather. Sweaters, I want my sweaters and gorgeous yellow, orange, and red leaves bursting from the trees. My hope is that baking with pumpkin will move summer along faster so fall can enter and I can bust out my sweaters! Line muffin tin with unbleached cupcake liners, set-aside. In a large bowl combine pumpkin purée, extract and sugar. 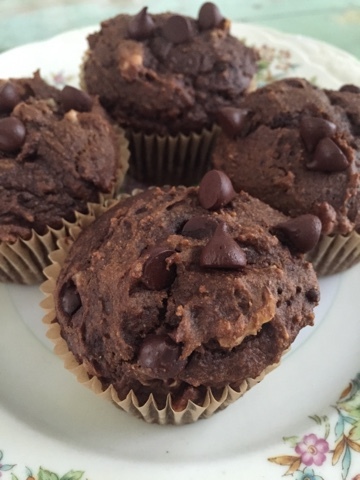 Mix in flour, cacao, baking powder, baking soda, salt, chocolate chips, and walnuts. Fill each muffin liner to the top. Bake 15-20 minutes, or until a toothpick when inserted in the middle of each muffin comes out clean. My daughter wanted to bake some cookies for her friend's birthday. 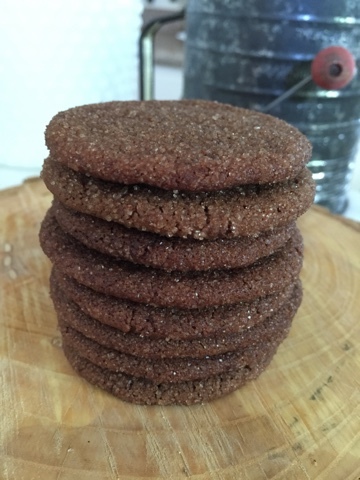 She wanted to make a cookie that we've never baked before, so she explored the Internet and found this recipe for Mexican Hot Chocolate Cookies on the Post Punk Kitchen blog. We pretty much kept the original recipe the same, just swapped a couple of ingredients. If you love a cookie with a kick, this is for you! I thought the cookies were a little too spicy; I am not a spice girl! The cookies have crispy edges and soft centers. Delicious! Though, I would cut down on the cayenne powder next time! Mix sugar and cinnamon together in a shallow bowl, set-aside. 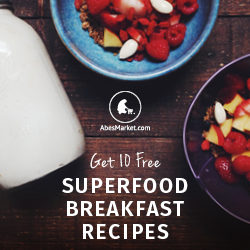 In a medium bowl, vigorously mix together melted coconut oil, sugar, agave syrup, and coconut milk. Add vanilla and chocolate extracts. To that, add remaining ingredients. Mix until dough forms. Roll dough into walnut sized balls and gently place into the sugar mixture. Flatten into roughly a 2 inch disc. Transfer to lined baking sheet, sugar side up. Leave at least 2 inches between cookies, they will spread slightly. If the dough becomes too soft to work with, place in the refrigerator for 10 minutes. Bake 10-12 minutes. Remove from oven and let cool 5 minutes before transferring them to a cooling rack. My inspirations for this drink were two large, very ripe, organic pears and a recent mail order delivery of organic ginger root powder. I decided to add some detoxifying cinnamon to the mix and some fig fiber for good measure. 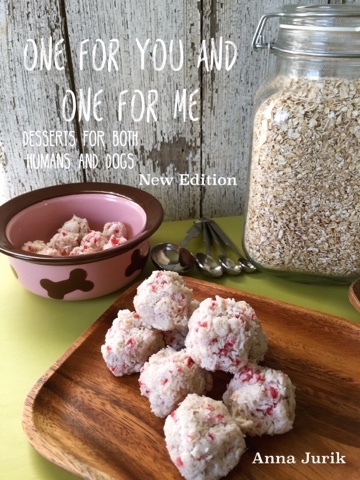 Enjoy this sweet and light meal! 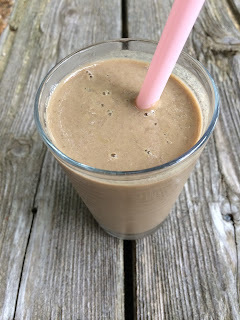 In the above order, in a Vitamix or high speed blender, mix ingredients from low speed to high, spending 20-30 seconds on high. In our garden, we have a mini apple orchard, twelve apple trees that produce bushels full of apples. We grow Macintosh, Red Delicious, and Golden Delicious. 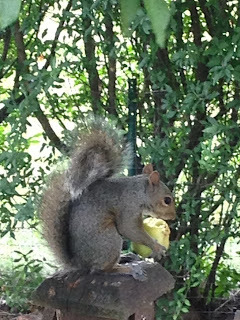 We are not the only ones who enjoy the bountiful apples. Many apples fall from the trees everyday and our resident rabbits, squirrels, chipmunks, and birds take full advantage of the fallen fruit. 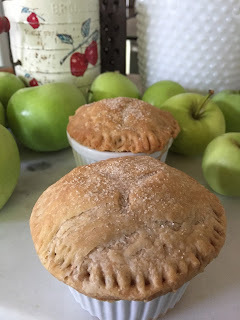 I love walking out to my orchard to pick apples, and then shortly turning them into scrumptious pies. Now what should I do with the hundreds more that will soon be ready to pick? In a large bowl, add flour, sugar, and sea salt. Using a large fork, cut in the shortening, making sure to leave pea size bits of shortening. Add 3 T of ice water and knead until a dough forms; add the additional 1 T or cold ice water if needed. Shape dough into a large disc, wrap in plastic, and refrigerate for 30 minutes. While dough is chilling start making the filling. 6 organic apples, seeded and diced. In a large mixing bowl, combine the apples, sugar, pumpkin spice, cinnamon, sea salt, and lemon juice. 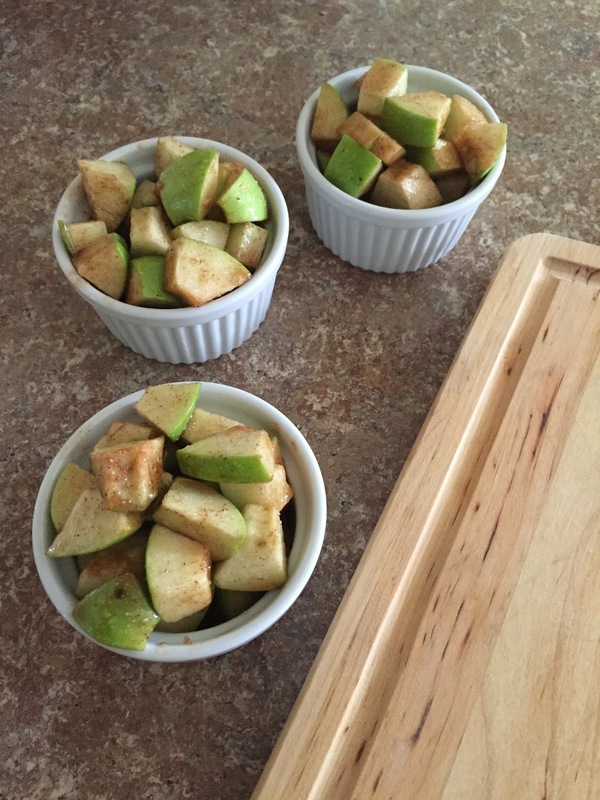 Evenly distribute the apple mixture into each ramekin. It may look like a lot of filling but the apples will bake down. Roll out chilled dough on a slightly floured cutting board. Cut out 4 circles that are slightly larger than your ramekins. I did this free hand with a sharp knife. Place dough rounds on top of each apple filled ramekin, using a fork crimp the edges all the way around. Use a sharp knife to cut 3 lines into the top of the dough. Brush the crust with the melted butter, and sprinkle with sugar. 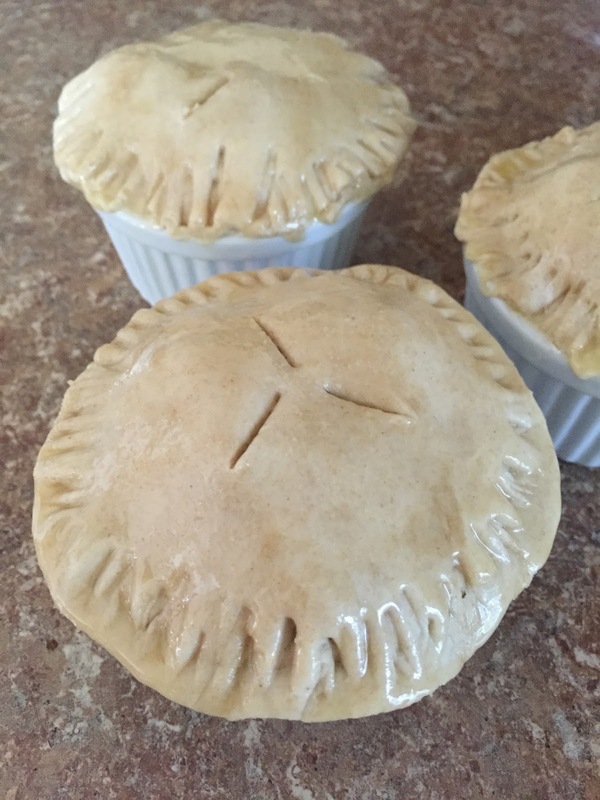 Place ramekins onto a baking sheet and bake for 20-25 minutes, or until the the crust turns a golden brown. Serve warm, or let cool slightly and top with vegan ice cream.